The store name comes from the resplendent quetzal, a bird that ranges from southern Mexico to Panama. 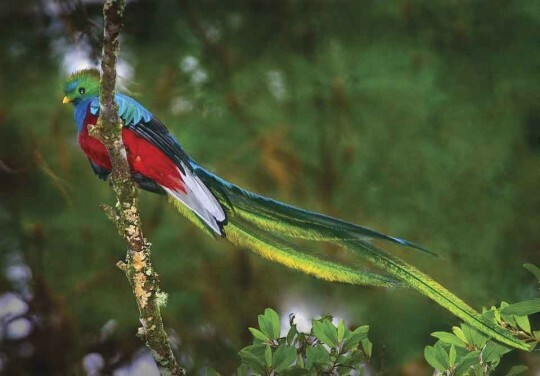 The Quetzal is the national bird of Guatemala and also the name of their currency. Because of it’s exceptional beauty the Quetzal has been revered for centuries by the indigenous people of Central America and has thrived in the high cloud forests of the region. The Aztec deity Quetzalcoatl may have played a fateful role in the Aztec’s acceptance of the Spanish conquistador Hernan Cortez when he arrived in Mexico in the 1500’s. Quetzalcoatl was a bearded white man who, according to their mythology, had previously visited the Aztec people, bringing gifts of corn, arts, sciences and possibly even the calendar. His expected return, foretold in a prophecy, was to take place around the time that Cortez appeared in the New World. Legend implies that Moctezuma ll, the Aztec emperor, who wore a headdress made of Quetzal tail feathers, welcomed Cortez into his court thinking that he could be Quetzalcoatl. The Mayan Indians of southern Central America also used Quetzal feathers in their ceremonial costumes and had their own version of the Aztec feathered serpent they called Kukulcan or Gukumatz. Quetzal feathers were traded by the Maya as far south as the Inca empire of Peru. The resplendent quetzal feeds primarily on wild avocado. The male, with spectacular tail feathers, is the one who sits on the eggs in nests hollowed out of trees. Today the Quetzal is endangered by the destruction of their cloud forest habitats by humans. To see one in the wild is a breathtaking experience never to be forgotten. 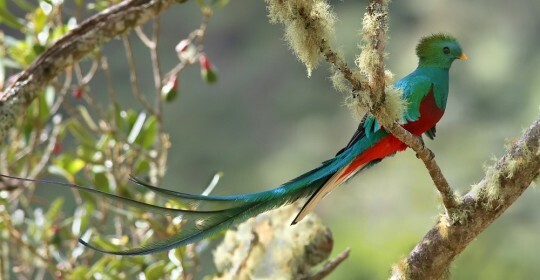 The Quetzal represents the rich natural and cultural treasures of Central America.